Was Abraham saved by faith or by works or both? Genesis 26:5, Because. Based on Paul’s teaching in Romans 4, we see that the Abrahamic Covenant is the model for salvation, which is salvation by grace through faith leading to or resulting in good works or righteousness (Eph 2:8–10). But this initial step of faith on Abraham’s part and the righteousness Elohim attributed to him was but the first step in Abraham’s faith walk. From that point, he had to walk out his faith and continue trusting YHVH (see also Gen 19:5). The apostolic writers present the idea that one’s spiritual journey is a walk, not a one time event that occurs at the beginning of that walk. Our faith walk is more than just mental assent with a few emotions thrown in for good measure. It’s more than just following the golden rule about loving our neighbor in some nebulous sort of way. It involves faithfulness to YHVH’s instructions. James clearly states in his epistle that this is how one demonstrates the legitimacy of one’s faith when he declares that faith without works is dead (Jas 2:18, 20, 26; see vv. 12–26 for context). Abraham demonstrated his faithfulness by his obedience to YHVH’s Torah or YHVH’s Word or voice. Furthermore, as a result of this obedience, YHVH promised to bless him beyond simply being granted initial salvation or righteousness. This two-step approach or model still holds true in the Testimony of Yeshua. One is saved or delivered from the wages of their past sin (Rom 3:25), which is death (Rom 6:23) by their faith (initial salvation), and then one ceases from that sin by continuing in the good works of Torah obedience (Eph 2:8–10). Moreover, Yeshua and the apostolic writers in numerous instances reveal that future rewards (both temporal and eternal rewards) come as a result of one’s good works (e.g. Matt 5:19). The ultimate reward is being granted eternal life and inclusion in the family of Elohim. Genesis 24:2, 9, Your hand under my thigh. (Heb. yarek; see also Gen 47:29) Abraham’s servant literally placed his hands on Abraham’s testicles swearing an oath on Abraham’s projected progeny, even as in modern times we place our hands on the Bible. Interestingly, the word testicle or teste derives from the Latin words testis meaning “testimony, testify and testament.” Yarek is the same word the KJV translates “hollow of his thigh” in Genesis 32:25 and 32, although, in this case, it seems to be referring to the tendon of the hip. Genesis 22:13, A ram caught in a thicket by his horns. YHVH credited to Abraham’s spiritual account his willingness to sacrifice Isaac as if he had actually done so. In fact, there is an ancient rabbinical tradition that states Isaac actually died and was resurrected as the midrash comments on this passage: “As the knife reached his throat, Isaac’s soul flew away and left [e.g., he died]. But when a voice went forth from between the angels saying, ‘Do not stretch out your hand against the lad’ (Genesis 22:12), his soul returned to his body” (Pirkei DeRabbi Eliezer 31 as quoted in The ArtScroll Davis Edition Baal HaTurim Chumash Bamidbar, p. 1417) (bracketed comments are in the original). 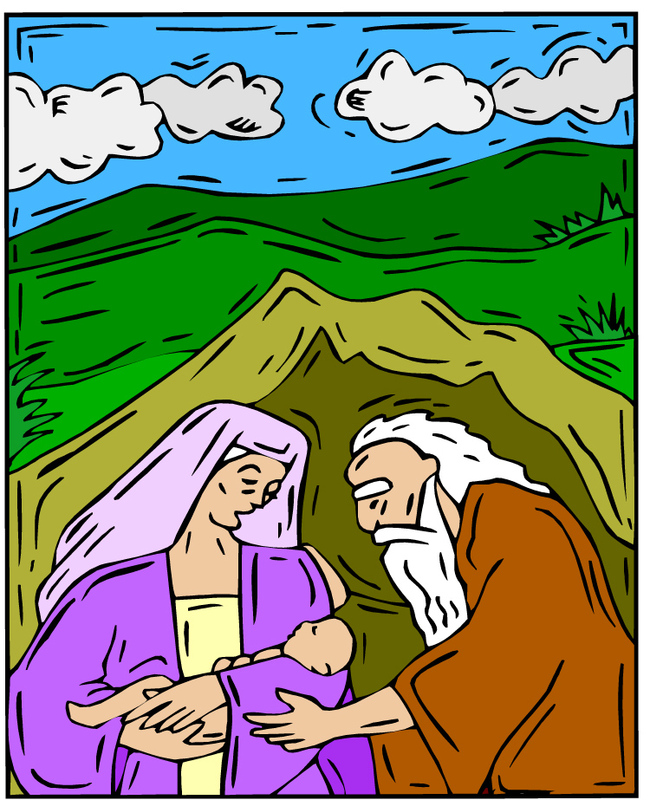 The Jewish sages also note that Scripture states that both Abraham and Isaac ascended the mountain, but that it is recorded that only Abraham descended (Gen 22:19). Isaac’s absence from the Genesis narrative until many years latter (Gen 24:62) has given rise to much speculation on the part of the sages as to Isaac’s whereabouts in the interim (The ArtScroll Bereishis Vol. 1a, pp. 812–813). Regardless of the rabbinic interpretations, does Scripture leave Isaac out of the narrative as if to highlight his absence, and to give the impression (albeit a prophetic allegorical one) that he was actually sacrificed? After all, what was the ram caught in the thorn bush thicket (wearing a crown of thorns) by its two horns all about? That ram is understood by many to be a substitute sacrifice prophetically picturing Yeshua the Messiah much later dying on the cross while wearing a crown of thorns. 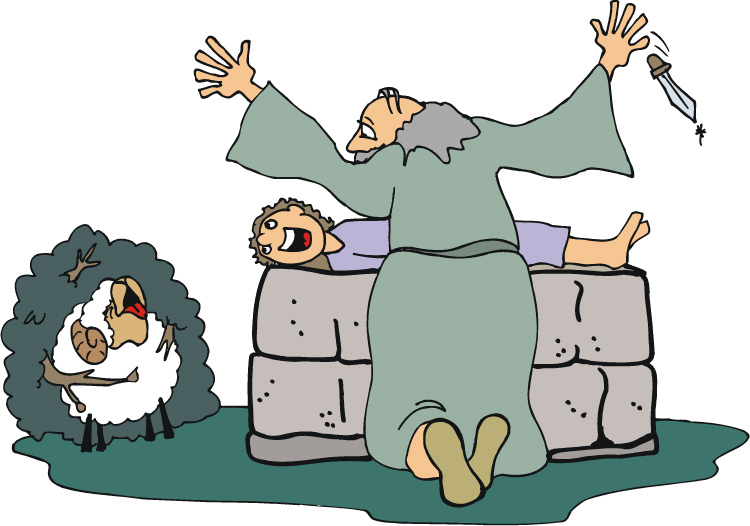 Moreover, who was it that commanded Abraham to lay down the knife and slaughter the ram instead? It was the Messenger (Heb. malak) of YHVH (verses 11–12, 15), who was none other than the pre-incarnate YHVH-Yeshua, the Word or Messenger of Elohim (John 1:1, 14), whose audible voice Abraham heard some 1900 years before his appearance as the Messiah in human form on earth as the Lamb of Elohim slain from the foundation of the earth. 11 And the Messenger/Malak of YHVH called unto him out of heaven, and said, Abraham, Abraham: and he said, Here am I … 15 And the Messenger/Malak of YHVH called unto Abraham out of heaven the second time, 16 And said, By myself have I sworn, saith YHVH, for because thou hast done this thing, and hast not withheld thy son, thine only son: 17 That in blessing I will bless thee, and in multiplying I will multiply thy seed as the stars of the heaven. In this passage, there is no mention of the Messenger of YHVH visibly appearing to Abraham in some bodily form, but only his voice calling from heaven. What we want to emphasize in this passage is that the Messenger of YHVH is equating himself with YHVH (verse 16). The biblical passages where the Malak of YHVH equates himself with YHVH while appearing in human form have perennially defied reasonable explanation by the Jewish sages. And Abraham said, The Word of Elohim will prepare for me a lamb; and if not, then thou art the offering, my son! And they went both of them together with a contrite heart. Abraham a Torah Keeper Before Moses? Let’s define the three highlighted words above in the larger context of the Scriptures. “Judgments” is the Hebrew word mishpatim (Strong’s H4941) meaning “ordinances” referring to YHVH’s moral and ethical laws as embodied in the last six of the ten commandments, which teach righteousness in one’s business and personal relationships. Can there be any doubt, if we’re to believe what the Scriptures literally say that Abraham was Torah observant hundreds of years before Moses (Abraham’s great, great grandson) was born? Lot and Sodom’s Liberation—A Severe Warning to Us All! Genesis 14:14, Three hundred and eighteen trained servants. This was a venerable fighting force for a nomadic chieftain to possess. If each of these soldier-servants had a wife and two children, this would have represented more than 1200 people associated with Abram’s army alone. No doubt Abram’s entourage could have been much larger considering those soldiers who had larger families as well as elderly people. The size of Abram’s personal community along with his wealth is likely why the sons of Heth referred to Abram as “mighty prince [Heb. nasiy meaning “one lifted up, chief, captain or leader”]” (Gen 23:6). This would have been true especially in consideration of the fact that Abram’s personal army probably marched about four hundred miles round trip to defeat the six Babylonian kings in his rescue of Lot (Gen 14:14–16). This was a tremendous feat for a local chieftain-warlord to accomplish. This accomplishment likely made Abram into a legend among the local Canaanites who would have greatly feared and respected him. Abram’s rescue of Lot and the residents Sodom from the six Babylonian kings brings to remembrance YHVH’s later promise to Israel that he would put the fear of YHVH into the hearts of their enemies and that one Israelite would put a thousand of their enemies to flight and two would put ten thousand to flight (Deut 32:30 cp. Lev 26:8). This promise is exemplified in the story of Gideon’s defeat of the Midianites by his band of three hundred men—a similar number to that Abram’s army. May YHVH’s servants in our day be walking in such righteousness and holiness before YHVH as to warrant this kind of favor from the Almighty to receive the same blessing when they go up against their enemies! Not only was the freeing of Lot and the other Sodomites a specular and miraculous feat—a testimony of the power of the Elohim of Abraham, but it was a testimony to these people of Elohim’s grace and mercy in that he rescued the Sodomites despite their wickedness. In spite Elohim’s warnings and grace, they still refused to turn from the wicked ways necessitating Elohim’s later judgment and destruction of that wicked city. The lesson is this. Elohim as a just and righteous judge warns people first by bringing upon them judgments onto repentance before imposing upon them his severe and ultimate judgments unto death. The problem is that most sinners are willingly oblivious to the initial warning signs, which if heeded, would bring them to repentance, thus sparing them Elohim’s ultimate and most severe judgments. YHVH’s methodologies don’t change; he is the same yesterday, today and forever. He warns people, gives them space to repent before judging them; he is not an unjust judge. Be assured, those wicked rebels who at the end of the millennial age will pass before Elohim’s white throne of judgment and who he will deem worthy to be cast into the lake of fire will have had plenty of warning and time for repentance (Rev 20:11–15). The fiery destruction of Sodom in the Dead Sea Valley, the lowest place on earth, is a prophetic picture of the final lake of fire judgment and should be a lesson to all humanity of what is to come if they fail to submit to Almighty YHVH. 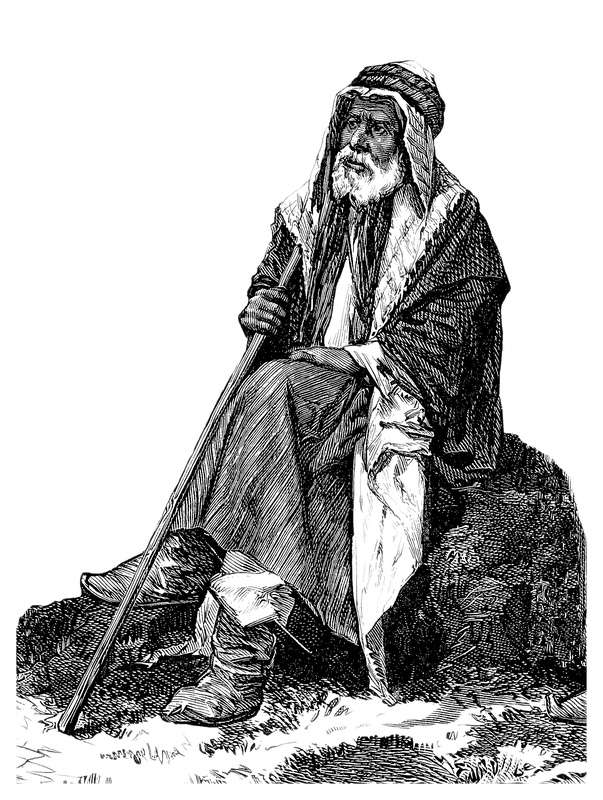 Abraham, a man of reluctant faith? The story of Abraham leaving Babylon reveals the great mercy of Elohim in one man’s life. Romans 12:2 talks about finding the good, better and perfect will of Elohim for our lives. 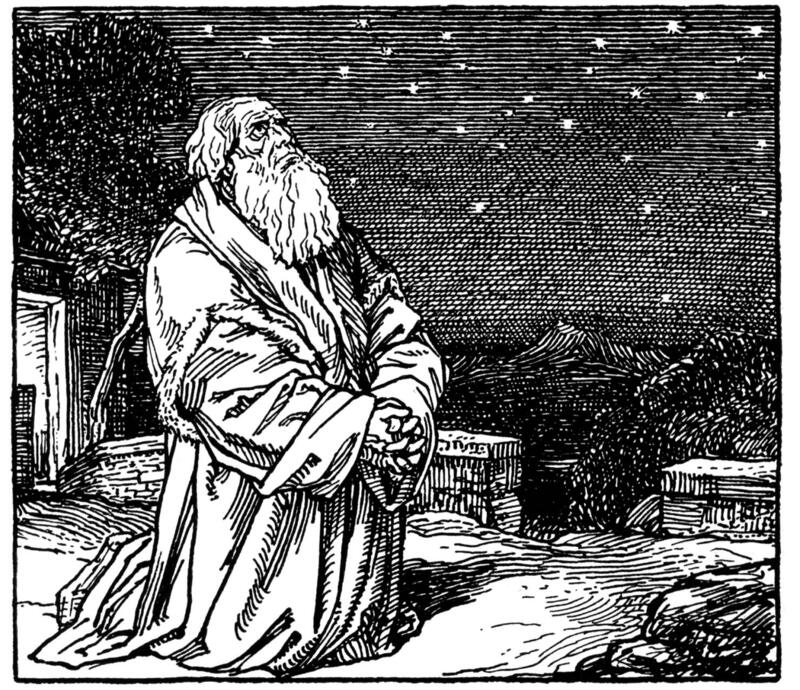 As much as we may respect and even venerate Abraham as the father of the faithful, it appears that he didn’t follow Elohim’s instructions perfectly at first. It wasn’t that Abraham was out of the will of Elohim, but that he may not have been in the perfect will of Elohim. Despite human weakness and reluctance to immediately follow the Creator’s instructions, YHVH was still merciful and gracious with the spiritual father of our faith. Genesis 12:1, Get thee out of thy country. Did Abram immediately leave his father’s house and go directly to the country that YHVH would show him, or did he fulfill YHVH’s will for his life in incremental steps? (Compare Gen 11:31 with 12:1.) Did Abram leave his father’s house completely, or take part of his father’s house with him including his father and nephew? Haran is located in northern Mesopotamia and is nowhere near Canaan. When Abram finally made his way to Canaan minus his father, did he still have part of his kindred with him, something YHVH instructed him to leave behind (Gen 12:1)? Did his nephew Lot prove to be a help or a hindrance to Abram in fulfilling YHVH’s mission for his life in a new land? What lessons can we learn from this account? First, YHVH is gracious to us even when we don’t obey him completely and immediately. Scripture still refers to Abraham as the father of the faithful or faithfulness (Rom 4:12, 16). 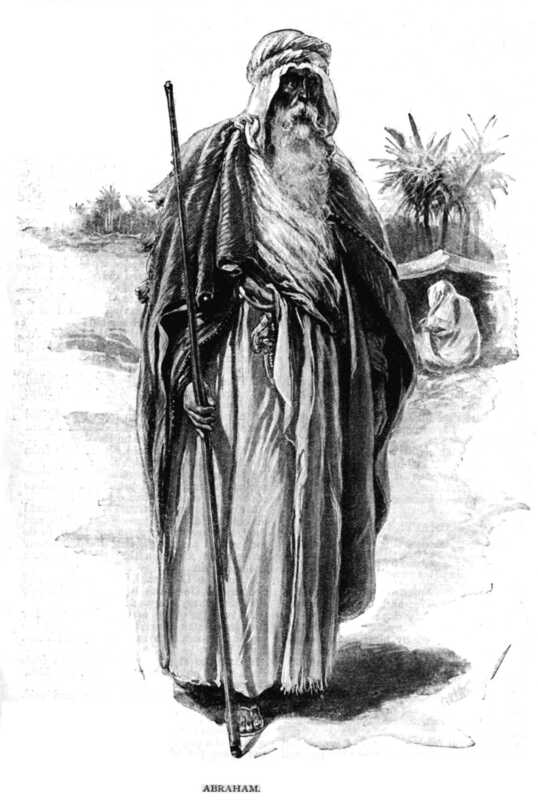 Second, Abram was a man of prominence in Babylon (or Chaldea), was recognized as a mighty prince (Gen 23:6), and was 75 years old when YHVH asked him to leave the comforts of life in Babylon to trek across the desert to the backwoods region of Canaan. No doubt, this was not an easy move for Abram for the reasons stated above. What did Yeshua tell his disciples about the sacrifices that would need to be made to be a follower of YHVH? (Matt 10:35–39). What did Yeshua say would be the eternal rewards of those, who like our father Abraham, set out in faith for a new spiritual destiny? (Matt 19:29) What physical obstacles stand in your way of fulfilling YHVH’s spiritual calling, mission and destiny for your life? Presently, YHVH is calling his people out of the spiritual Babylon (Rev 18:4) of man-made religious systems that, to one degree or another, have supplanted the simple truths of YHVH’s word with doctrines and traditions of men. Anything that takes precedence in the hearts and minds of men that is contrary to the Bible is, by biblical definition, an idol. End times spiritual Babylon is full of idolatry. It is a confused mixture of truth and lies. YHVH called Abram out of Babylon, and he’s calling his people out of Babylon today to worship and obey him in Spirit and truth. 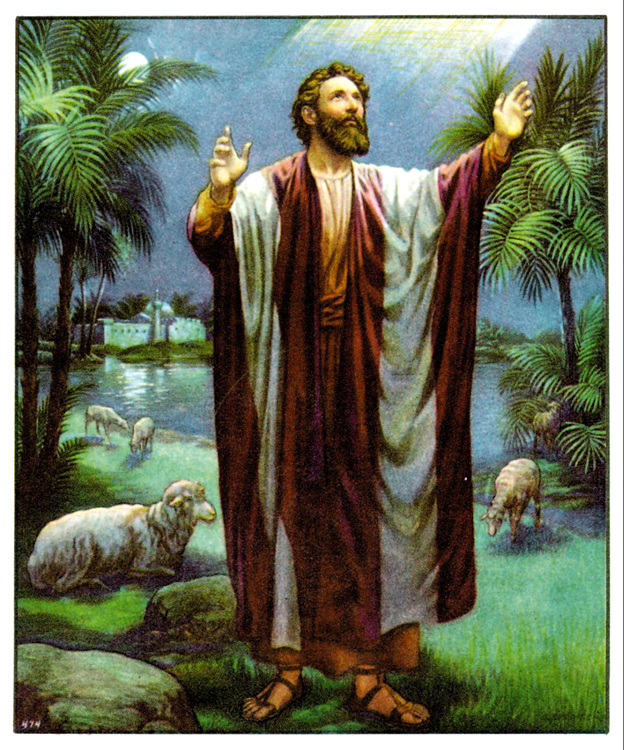 His end time saints will be those who follow Yeshua the Messiah unconditionally wherever he goes (Rev 14:4–6). Their chief identification mark is that they follow the Torah-commandments of Elohim and have the faith of Yeshua—their lives have been transformed by the message of the gospel (Rev 14:17; 12:14). But this initial step of faith on Abraham’s part and the righteousness Elohim attributed to him was but the first step in Abraham’s faith walk. From that point, he had to walk out his faith and continue trusting YHVH (see also Gen 19:5). The apostolic writers present the idea that one’s spiritual journey is a walk, not a one time event that occurs at the beginning of that walk. Our faith walk is more than just mental assent with a few emotions thrown in for good measure. It’s more than just following the golden rule about loving our neighbor in some nebulous sort of way. It’s faithfulness to YHVH’s instructions. James clearly states in his epistle that this is how one demonstrates the legitimacy of one’s faith when he declares that faith without works is dead (Jas 2:18, 20, 26). This two-step approach or model still holds true in the Testimony of Yeshua. One is saved or delivered from the wages of their past sin (Rom 3:25), (Rom 6:23) which is death, by their faith (initial salvation), and then one ceases from that sin by continuing in the good works of Torah obedience (Eph 2:8–10). Yeshua and the apostolic writers in numerous instances reveal that future rewards (both temporal and eternal rewards) come as a result of one’s good works (e.g. Matt 5:19). The ultimate reward is being granted eternal life and inclusion in the family of Elohim. Abraham obeyed my voice, and kept [also: observe, preserve, guard; shamar, my charge [mishmereth], my commandments [mitzvah] my statutes [chuqqah], and my laws [toroti]. There are those who teach that the Torah-law does not predate Moses. Not only does this verse disprove that, but it also shows that Abraham kept the Torah-law of Elohim. In a Hebrew lexicon or word dictionary, look up each of these words and study their meanings and how they are used contextually in the Scriptures. My voice. This verse equates the voice of Elohim with his Torah commands. To obey the voice of Elohim is to obey his Torah instructions. The voice and Torah of Elohim are two ways of saying the same thing. 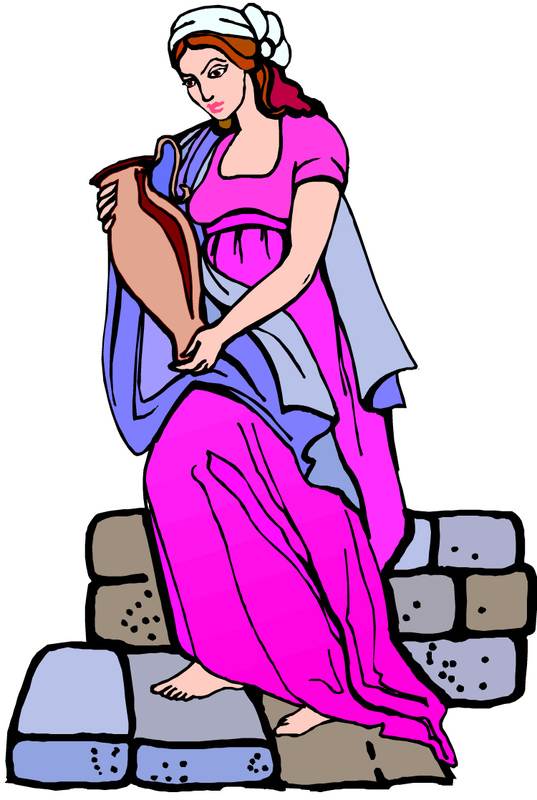 YHVH’s servants were obeying his voice, the Torah, long before it was written down by Moses. Torah primarily signifies “direction, teaching, instruction” (Prov 13:14). It is derived from the verb yarah [meaning] ‘to project, point out’ and hence to point out or teach. The law of [Elohim] is that which points out or indicates His will to man … Seen against its background of the verb yarah, it becomes clear that Torah is much more than law or a set of rules. Torah is not restriction or hindrance, but instead the means whereby one can reach a goal or ideal. The word Torah basically means “teaching” whether it is the wise man instructing his son or [Elohim] instructing Israel. The wise give insight into all aspects of life so that the young may know how to conduct themselves and to live a long blessed life (Prov 3:1f). So too [Elohim], motivated by love, reveals to man basic insights into how to live with each other and how to approach [Elohim]. Through the law [Elohim] shows his interest in all aspects of man’s life which is to be lived under his direction and care. Law of [Elohim] stands parallel to [the] word of [YHVH] to signify that law is the revelation of [Elohim’s] will (e.g. Isa 1:10).